Venture into the northeastern Aegean and discover Lesvos (Lesbos): the third largest Greek island and, to the mind of the thousands of serial visitors who come here year after year, one of the most astoundingly beautiful locations on planet Earth. It is easy to gather why Lesvos has taken such a firm hold of the heart of so many travelers, hundreds of whom have such a deep affection for it they even decided to turn over a new leaf in the island. Visit here and you will be enchanted by one of the most diverse natural landscapes in Europe, marvel at its dramatic greenness and fall for the island’s long-cherished traditions, customs and history. Whether you are already a seasoned traveler or on a virginal journey to the country of Greece, a holiday in Lesvos is certain to become the experience of a lifetime. The third largest island location in Greece, Lesvos boasts a thriving capital, Mytilene, and a large range of other must-visit spots. Aside from its cosmopolitan capital city, the resorts of Skala Kalloni, Petra, Eresos and Molyvos, the towns of Agia Paraskevi, Kalloni and Agiasos and the island’s wealth of amazing beaches, there is an array of visit-worthy locations where modernity has been kept at bay and life continues to unravel to the sound of birdsong. Whether you are keen to have a first-hand experience of the resorts for which Lesvos has become internationally renowned or discover the island’s wealth of little-explored villages and seaside, Lesvos is certain to mesmerize you with the variety of outings, sights and activities it has in store for its visitors. Whichever way may you decide to spend your stay, one thing is for certain: you will need a car (or at least a moped) to make the most of your trip to the island. An island in blue, green and gold, Lesvos has been endowed with the gifts of nature so richly an experience of the island is akin to an initiation into color and light. To so many of its lovers across the globe, Lesvos is a world where the sea may only be shimmering, the earth overgrown and the sunlight a caress of light causing the land to thrive. The island that has long inspired so many artists and intellectuals is bound to fascinate, thrill and enchant you with its dramatic natural setting, famous biodiversity, attractions, rural locations and history. A journey here may not be right for you if extortionate prices, fully-fledged tourist resorts and crowded beaches are what you are after. 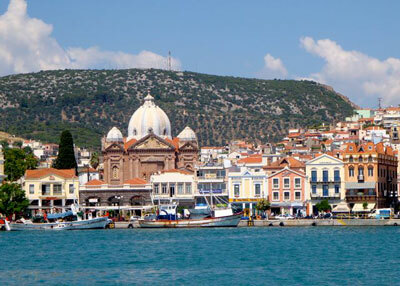 But, if they aren’t, Lesvos is destined to become the place where all your holiday dreams come true. 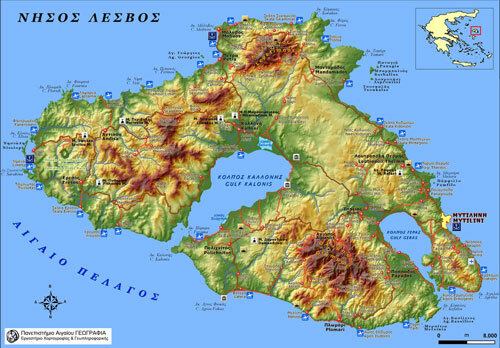 Lesvos covers a total area of 1636 sq km. Only a few miles away from the northwestern Turkish coast, it has been blessed with all of the natural wealth only an island on the frontier between the East and the West can so generously exhibit. The seemingly endless olive groves, fragrant green pines, chestnuts and oaks, the biodiversity and untouched natural landscape of Lesvos are simply splendid to gaze at. An island ideally suited to lovers of nature and all things green, Lesvos is renowned for its magnificent flora and wildlife and is a firm favorite with birdwatchers across the globe. Its forests, valleys and ravines, its waterfalls and caves, the Bays of Gera and Kalloni and Mount Olympos (the island’s highest peak) are areas of immense botanical and zoological interest and have long been favored by nature and wildlife photographers. If you are keen on bird watching, come here and be astounded at the diverse range of migratory birds that stop on the island on their journey to warmer climes. The magnificence of Lesvos is predominantly owed to its mild climate and geomorphology, which have meant that the island is composed of a dramatically varied landscape. The ‘Wild West’ of Lesvos is almost ‘lunar’ in its sparseness where the east, north and south of the island are profusely green. Natural hot springs are in abundance on the island, making it ideally suited if you are keen to discover the appeal of the ancient practice of bathing in healing thermal water. 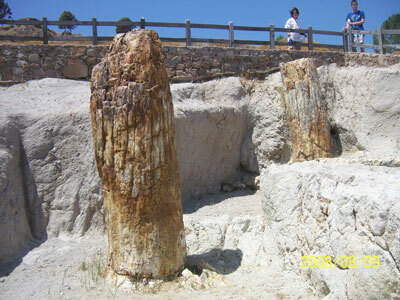 If you make the trip to western Lesvos, you will encounter one of the greatest natural monuments on the planet: the Petrified Forest of Sigri draws large numbers of visitors to the island each year and a wander in the Geopark will acquaint you with the petrified giants of Lesvos - large numbers of fossilized (mainly sequoia) trees that make up the second largest petrified forest on Earth. Lesvos benefits from an immense, varied landscape. A haven for birds, wild animals, insects and flowers, it is particularly productive in spring, when droves of birdwatchers come to the island. The marshlands of Kalloni, Skala Kalloni, Eresos, Kambos Antissas, Sigri and Molyvos are among the most popular bird watching regions, while Achladeri woodland and Lesvos’s saltpans, marshlands and seasonal rivers and streams attract thousands of birds together with a range of insect and animal species. 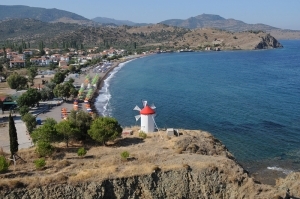 Originally a part of the Turkish coast which became separated off as a result of geological disturbance, Lesvos occupies a unique position in the Aegean. 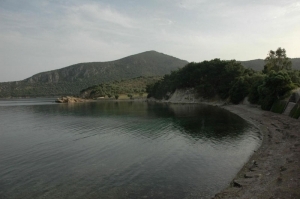 At such close distance to the Asia Minor shores, it is an island of diverse ecosystems where wildlife is in abundance and the natural landscape so varied it may accommodate a huge range of migrant and breeding birds, reptiles and amphibians and even Asian squirrels (in fact, Lesvos is the only European location with a population of these rare animals). The element of water being strongly present in the island all through the year, Lesvos is one of the greenest locations in the entirety of Greece. With so much of its surface swathed in overgrown nature and lush woodland, it is an ideal destination if you are fond of walking in nature or hiking in overgrown lands. 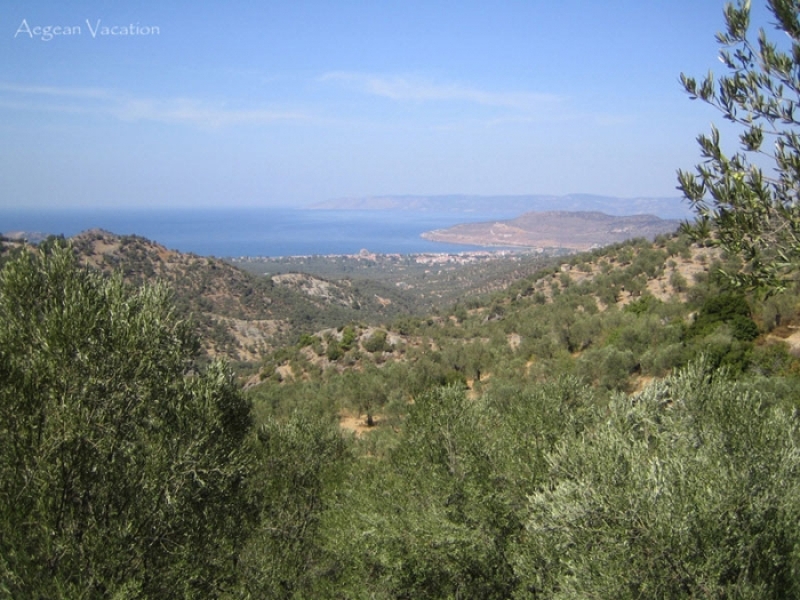 The greatest part of the island is traversed by nature trails leading the visitor through a magical setting of olive groves, luscious forests, tiny old villages and wonderful panoramic views. There is a vast number of walking or hiking routes and itineraries to choose from - just bring a map, sturdy shoes and a sun hat and go off on an exploration on this greenest of lands. Depending on your choice of accommodation, you could even join a walking tour of the island, as several are organized by local accommodation providers. Picture the perfect holiday to the Aegean and, depending on your temperament and mood, you might summon the image of a vibrant seaside location or a remote, dreamy shore. With an extensive, 370-kilometer coastline, Lesvos includes a broad range of beaches (a large number of them Blue Flag) where a wealth of activities may be tried, the cool, crystalline water of the Aegean sampled and a good read savored under the glowing sun. Whether you are a lone traveler or travelling with your family, the beaches of Lesvos will provide an ideal setting where the beauty of nature abounds and wonderful memories are made. Lesvos boasts a limited number of tourist resorts in the proper sense: while areas such as Skala Kallonis, Petra, Molyvos, Vatera and Skala Eresos enjoy a healthy degree of touristic development, they remain close to their roots and tourism has deprived them of none of their natural beauty and essentially traditional, peaceful character. Lesvos, in this respect, may not be an ideal destination for you if you are one for over-developed resorts, packed nightclubs and crowded beaches. If, however, you are keen to discover an island where the beauty of nature abounds, the locals are genuinely welcoming and even the more popular areas benefit from a relaxed atmosphere, look no further than Lesvos. With such a huge array of activities, visit-worthy locations, fabulous beaches and unexplored countryside to choose from, it is unlikely you will spend a single dull moment in Lesvos. While the island has benefited from touristic development, it has done so on a modest scale. Its population of around 100.000 permanent residents is mainly engaged in agriculture, fishing and farming and has cherished the island’s traditions and customs for centuries. Lesvians are a welcoming people with a deep affection for tradition and the customs of Lesvos have been preserved to a very important degree. A variety of ‘panigyria’ (religious festivals), celebrations and rituals unravel in Lesvos, one of the few places in Greece where weddings are still a joyful affair in which the entire population of a village becomes involved and religious festivals are celebrated with such great aplomb that festivities continue all through the night. 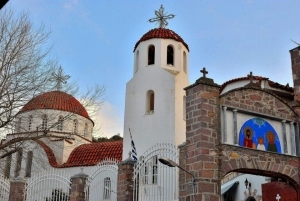 Religion has a strong presence in Lesvos and some of the most remarkable monasteries and churches in Greece are located in this splendid north Aegean island. A site of pilgrimage for hordes of believers, Lesvos includes several noteworthy monasteries (the Monastery of Taxiarches in Mandamados and of St. Raphael in Thermi are the most prominent) and two of the most magnificent churches in Greece: the Virgin Mary of Agiasos and Agios Therapon, the church so many consider the crowning glory of Mytilene. If the Orthodox Christian faith has resulted in the island’s variety of religious monuments (some of which are among the oldest you are likely to encounter in Greece), the culture of Lesvos is the result of a variety of historical developments and cultural shifts. Due to its geographic position at such close proximity to the East, and as a result of its long years of occupation by the Romans, the Genoese and the Ottomans among a number of other invaders, the island exhibits a range of Eastern and European elements - making its culture one of the most stimulating and inclusive across the globe. With a history that reaches back two-million years, Lesvos is one of the most culturally and historically stimulating locations in Greece. According to experts, Lesvos had already developed an outstanding civilization by the late Bronze Age and would change hands several times in the course of its tempestuous history from 1507 BC (when the Pelasgians invaded Lesvos) to 1923 AD (when, having been placed under international occupation for nearly two decades, the island was ultimately ceded to Greece). In the intervening period, Lesvos would come under the Aecheans (1393-1184 BC), the Aeolians (1100-1000 BC), the Persians (456 BC), the Egyptian Ptolemies, the Romans, the Genoese and the Ottomans. With each of its different rulers bearing an impact on the history, art and architecture of Lesvos, it is hardly surprising that the island has acted as a melting pot where different influences, traditions and aesthetics unite. If its archaeology speaks of a strong ancient civilization, its art and architecture display such a variety of influences that the Roman, the Genoese and the Ottoman may harmonically co-exist in a landscape of Pre-historic ruins, ancient temples, architecturally astonishing mansions, castles and old Byzantine churches. Lesvos boasts an array of archaeological sites, among them the impressive Roman Aqueduct of Moria, the Castles of Mytilene and Castle of Molyvos and, in the area of Messon, the remains of the only Aeolian building to be discovered in the whole of Greece. Make the time to visit its Archaeological and Byzantine Ecclesiastical Museums (both conveniently located in Mytilene) and you will be able to admire an array of archaeological and religious treasures that portray something of the diverse historical, cultural and political life on the island. Alternatively, go on a tour of this magnificent region and explore the wealth of archaeological sites, historical monuments, tiny villages and multitude of remote beaches of Lesvos. As the orator Cicero said of Mytilene, the great Lesvos capital is nothing short of “a town made gorgeous by its natural surroundings, its site, the facades of its buildings and its fertile fields.” In so many respects, Cicero’s praise of Mytilene holds true for the entirety of Lesvos island. Choose from a cosmopolitan island capital, a broad range of rural locations and fabulous beaches and some of the most dramatic natural scenery on planet Earth and Lesvos is certain to astound you with the plethora of sights, activities and experiences it has in store for its visitors. Sip on a glass of cool local ouzo, see it magically cloud as soon as you mix a little water into the transparent fluid and toast your arrival to the island. There is no better accompaniment to an evening of marveling at the starry sky, taking in the gently setting sun or gazing at the shimmering splendor of the Aegean, hoping the moment could last for a lifetime.